A large, enthusiastic crowd assembled on a sunny, if somewhat chilly Wednesday evening in Herbert Park to join Dr. Ciara Kelly of Newstalk and Operation Transformation fame, complete the last leg of the #100daysofwalking project. The initiative to walk for thirty minutes every day was started on New Year’s day and reached its milestone century on April 10th. Everyone was in a relaxed mood, with music pumping out into the park. The Newstalk people were on hand giving out goody-bags crammed with everything the enthusiastic walker needs. 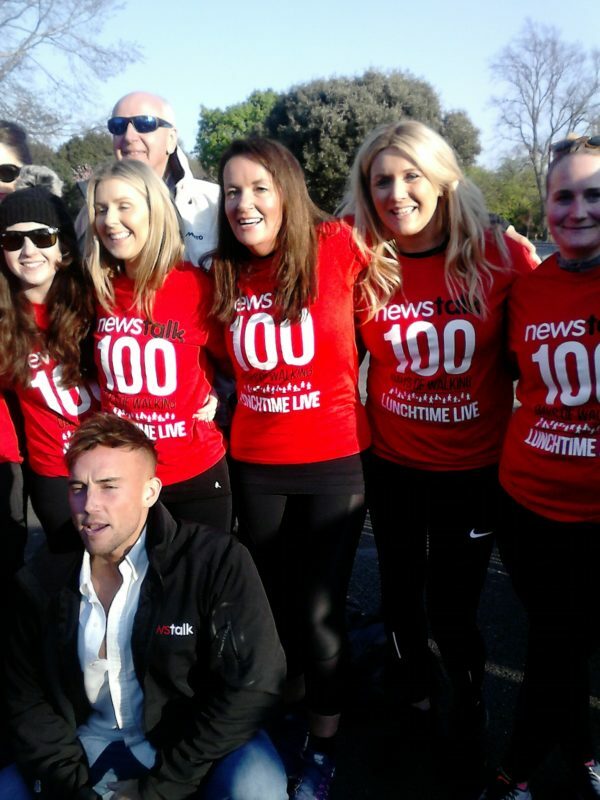 Ciara thanked all , her followers (many present at the event) for joining in on the walk, and thanked the people at Newstalk for being so supportive. She then led the crowd on what was officially the 100th day of the walk around Herbert Park. Thinking about #2019…Want to make some changes so gonna start #100daysofwalking tomorrow 1st Jan – walking for at least 30mins everyday for 100 days..will hopefully make for happier healthier year! AND feel awesome come April 10th!! Who’s in?? As it turned out a lot of people were, including many who follow Ciara on twitter or listen to her radio show Lunchtime Live, weekdays from 12 noon to 2pm on Newstalk. Even those who hadn’t started on January 1st were encouraged to join whenever they wanted. There are many benefits of walking. These include: building stronger muscles, better posture, improved sleep, and benefits to the respiratory and cardiovascular system. And Ciara also stressed the many psychological payoffs too: such as like feeling good about yourself, feeling more confident, and using small achievements to motivate you to take on bigger goals. This gives you a powerful sense of inner fulfillment and self-empowerment. Contrary to what a lot of people may think you don’t have to sweat for hours in the gym each day to feel good and have a healthy body. All it takes is a little exercise daily, particularly walking, and you will see rapid changes, quickly. The message that Ciara had been eager to get out is: “Just make one simple change in your life.” And even if it’s the first you’ve heard of it, you can still join in the walk, because although she’s achieved the 100-day landmark Dr. Kelly has no intention of stopping.You don’t have to register anywhere, pay anything, or join anything. Just commit to walking for thirty minutes every day, and stick to it no matter what. Start today. You will see a big change in a very short time. All it takes is one step at a time. So, well done to Ciara and all the others that joined her on having achieved the 100 days. Keep on walking.